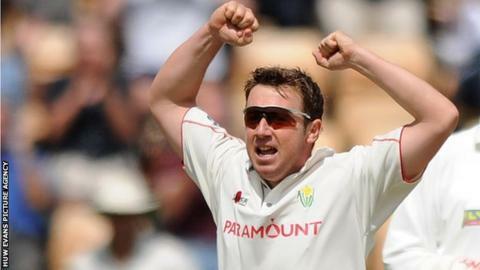 Robert Croft believes he retires from playing for Glamorgan with the long-term future of the Welsh county's squad looking bright. The off-spinner will bow out after 23 years at the Welsh county. "What's nice is that I can see that there's good, young talent coming through, particularly in the position that I play in," Croft said. "I never wanted to be someone who was holding a possible future Glamorgan player back." Croft, who will play for the final time in Glamorgan's County Championship Division Two game against Kent that starts on 11 September at the Swalec Stadium, will carry on in a coaching and marketing role. "I'm 42 and waking up in the mornings after a long, hard day, trying to go down the stairs gets a bit more difficult!" Croft added. "We got to this point yesterday [Wednesday], met with Alan Hamer the chief executive and the management company that looks after me and we got into a deal. "It seems good for all parties, it's a one-year deal and hopefully if I can make a good fist of it it will be something that can carry on further. "I'm not going to walk into this role and think I'm going to be the greatest coach. What I am going to do is try to build up my knowledge, build up the way I do it and eventually become somebody who is regarded as a top coach. "I've got to say that because that's my ambition. It's similar to playing: you're not the finished article when you start." Glamorgan great Don Shepherd paid tribute to Croft after his decision to hang up his boots. Four players have taken 1000 wickets for Glamorgan, with Shepherd the last to pass that mark in 1960 before Croft reached the milestone in 2010. Croft also hit 10,000 runs for the county, making him the only Glamorgan player to achieve that double mark. "He's probably among the top two or three all-rounders," Shepherd said. "In terms of statistics I think no-one has matched him [at Glamorgan] with his 10,000 first-class runs and 1000 first-class wickets." "And you have to remember that the game has changed a huge amount since the cricket I played and the sort of cricket Robert has had to play throughout his career," added Shepherd, who claimed a county record of 2174 wickets between 1950 and 1972 with his mixture of seam and off-cutters. "So it's a remarkable achievement; his fitness, his stamina, he was one of those who was born with a beautiful [bowling] action. "I've known him since he was an early teenager and there's not very much that has ever had to be done to his action. "He's been wise enough to speak to lots people along the way and he's always sifted through what he's been told, and he's sorted it out himself and put it into action. He's been very wise in that respect." Croft made his England Test debut in 1996 against Pakistan and went on to win 20 more caps, taking 49 wickets. He played 50 games for England's one-day side, being a regular from the end of 1996 until the World Cup in 1999.